An exhibition of work by designers BIG-GAME is on show at museum Grand-Hornu Images near Brussels, Belgium. Called Overview, the show will include work created since the Brussels and Lausanne-based design studio was founded in 2004. A book entitled BIG-GAME Design Overview accompanies the exhibition and is available from publishers Stichting Kunstboek. The exhibition opened in October and continues until 22 February 2009. In this monographic exhibition at Grand-Hornu Images, Grégoire Jeanmonod (CH), Elric Petit (BE) & Augustin Scott de Martinville (FR) present a selection of works by BIG-GAME, their product design studio. The three designers met at the ECAL, the Cantonal School of Art of Lausanne. The Belgian, Frenchman and Swiss together shared a passion for the aesthetics of industrial design and soon developed their own formal language. Taking basic elements as starting points, such as a material, a principle or an archetype, Big-game transforms them in a simple way to design functional objects. Their work is minimalist, with a humourous, sometimes slightly subversive touch. 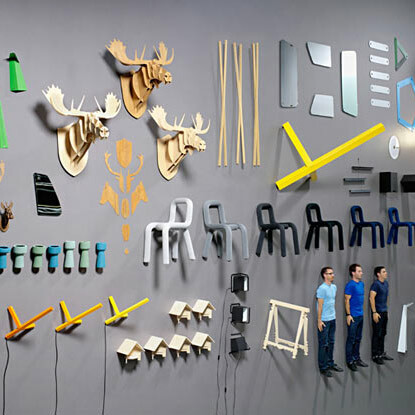 They founded the design studio Big Game in 2004, based in Brussels as well as in Lausanne. Since then, they have introduced several collections, including HERITAGE IN PROGRESS, NEW RICH, PACK SWEET PACK and PLUS IS MORE. In this relatively short time they have collaborated with, amongst others, Ligne Roset, Galerie Kreo and Inout Designers. Their Moose trophy, edited by Vlaemsch, can already be called a contemporary classic.